Invisalign can give you the beautiful straight teeth you've always wanted. It works through a series of invisible, removable, and comfortable aligners that no one can tell you're wearing. So you can smile more during treatment as well as after. Invisible, so no one can tell you're straightening your teeth. Now you can smile more during treatment as well as after. Comfortable, because it has no metal to cause mouth abrasions during treatment. And no metal and wires usually means you spend less time in doctor Wissinger’s office getting adjustments. You wear each set of aligners for 1 week, removing them only to eat, drink, brush, and floss. As you replace each aligner with the next in the series, your teeth will move - little by little, week by week - until they have straightened to the final position Dr. Wissinger has prescribed. You'll visit Dr. Wissinger about once every 3 weeks to ensure that your treatment is progressing as planned. Total treatment time averages 6-12 months and the average number of aligners worn during treatment is between 18 and 30, but both will vary from case to case. Finally - A painless way to reshape and permanently whiten your smile. Plus, a Lumineers Smile is clinically proven to last over 20 years - and, since your natural tooth structure is left intact, it's one of the least invasive paths to a beautiful smile. Lumineers is also an excellent finishing treatment when used to beautify your smile after Invisalign treatment. Healthy and even gumlines are essential to any beautiful smile. Attractive gums complement and frame your teeth, making your smile look healthier and more attractive. If your gums are red and swollen or if your teeth look too small or too short because of the disproportionate size relationship between your teeth and gums, then gum contouring may be the solution for you. Gum contouring can give you the consistent, even gumline you need for a healthy and attractive smile. It took over thirty years to complete the partial restoration of what is arguably the world's most famous smile - the Mona Lisa...and her enigmatic expression doesn't even reveal any teeth. But with Cerec restorations, Dr. El Wissinger can give you a beautiful smile with natural, porcelain veneers. Your smile will have classic beauty in a single visit - and the results will stand the test of time. 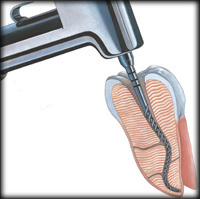 Rotary Endodontics, or root canal, is a method in which Dr. Wissinger utilizes an electric handpiece to perform the procedure. The electric handpiece allows the Dr. Wissinger to clean and shape the canals faster than using hand files and because it’s electric, there is no drill noise. This makes the whole treatment experience much more pleasant. Composite bonding is a cosmetic dentistry technique that can work wonders for your smile. At E-Dental Solutions we use materials that match the shade, translucency and texture of your teeth, tooth gaps can be closed, spots, chips, and discolorations can be eliminated, and your self-confidence can be enhanced through the improved appearance of your smile. It's also great for an instant repair of a broken front tooth. Bonding for teeth involves the use of composite resin tooth-colored filling material and can be used on the front or back teeth. The procedure is sometimes referred to as bonding because an adhesive agent is used to actually bond the resin to the tooth structure. At E-Dental Solutions, Dr. Wissinger uses intra-oral fiber optic cameras to view your teeth and gums in precise detail. These images are transmitted to a computer monitor, where Dr. Wissinger can communicate information about diagnosis and treatment options with you more easily than was possible in the past. Dr. Wissinger uses Microscopic dentistry to help her precisely examine teeth and perform operations at a microscopic level. When using the high magnification during procedures, she is able to see microscopic details that are simply impossible to visualize with either the naked eye. By using surgical operating microscopes, dental restorations have an incredibly precise fit and finish. With microscopic dentistry E-Dental Solutions is able to provide precision in dental care that is exceptional. E-Dental Solutions uses Laser Cavity Detection to detect a weakness in a tooth before it becomes a cavity. That could mean no more Novocain shots and no more drills. The technology puts out a laser beam into the tooth, and that light reflects back toward the laser, If there's decay, there's a change in the wavelength and Dr. Wissinger gets a reading from zero to 100 and is able to tell not only where the decay is, but how deep it is and how much decay there is. E-Dental Solutions uses VELSCOPE, a revolutionary hand-held device that offers Dr. Wissinger and her staff an easy-to-use adjunctive screening instrument for early detection of soft tissue abnormalities. Its technology platform is based on the direct visualization of tissue fluorescence and the changes in fluorescence that result when abnormal tissue is present. This change is detected by the operator viewing the tissues through a special scope which is not evident under incandescent light. 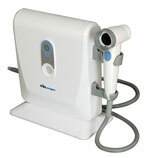 VELSCOPE is recognized world wide as a major advance in the detection of oral cancer. VELSCOPE provides a more effective oral cancer screening protocol with immediate benefits for you, the patient and the clinician. Oral cancer refers to cancer of the soft tissues of the lips, mouth, and throat and generally has a poor prognosis, most likely because early diagnosis is difficult, and problems are usually picked up in the disease’s later stages. One person dies from oral cancer every hour in North America. 31,000 cases are diagnosed in North America every year. There are 9,700 cases of cervical cancer diagnosed in North America every year. Oral cancer is the 6th most serious form of cancer. The mortality rate of oral cancer is twice that of cervical cancer. There has been a 60% increase in incidence in under 40’s in the last 3 decades.